“Maiden Voyage” is the first fully staged production by Parley, a Seattle playwriting collective founded by Rebecca Tourino Collinsworth. 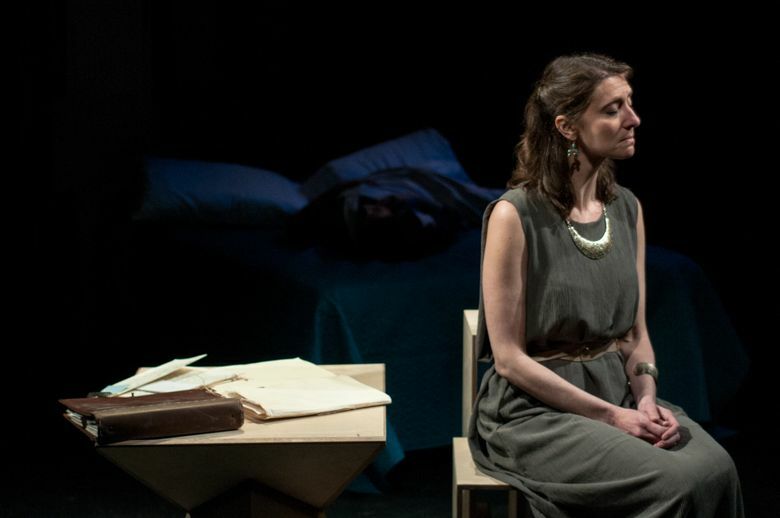 Homer’s “The Odyssey” is a sprawling piece of work — it’s an epic poem; of course it sprawls — so it’s fitting that Rebecca Tourino Collinsworth’s new play “Maiden Voyage” is at its best when it’s doing just the opposite. Like many riffs on classics, “Maiden Voyage” flips the script in more ways than one, but in a play full of thoughtfully deployed reversals, it’s the small-scale specificity of individual scenes that stand out. This is no epic; it’s a chamber drama that explores many facets of two women’s dissatisfaction and displacement in their own home. “Maiden Voyage” is the first fully staged production by Parley, a playwriting collective founded by Tourino Collinsworth that’s put up numerous readings and workshops since 2014.
by Rebecca Tourino Collinsworth. Through June 11, at West of Lenin, 203 N 36th St., Seattle; $10-$15 (parleyproductions.com). Penelope is a savvy manipulator of media appetites, casting herself as the loyal, long-suffering wife, while also entertaining a host of (offstage) suitors vying for her hand. In this male-dominated society, a woman must be both chaste and continually available to any man who seeks her attention, and Penelope knows how to play the game. She’s also adept at weaving fanciful tales that continually reset the story — Sirens! Witches! A Cyclops! — and though her companion and confidante Phemius (Jon Stutzman) complains she’s just repeating herself, Penelope clearly knows how to keep her readers coming back for more. Penelope also shares a close bond with maidservant Melantho (Isis King), who has a secret that’s bound the pair together for many years. There’s a foundational melancholy to King’s performance that attaches itself to Ruzumna as the play unfolds. At times, “Maiden Voyage” is a pointedly funny take on familiar source material, but the play’s overriding mood is one of bone-deep sadness. Both Penelope and Melantho are women out of place in their own era, and both are well aware that things aren’t changing for the better any time soon. As for the men in “Maiden Voyage”? Well, they’re not so impressive, especially Odysseus, who returns with all the gravitas of an alcoholic stumbling back from the bar. Beau M. K. Prichard’s performance is full of false bluster, and though Ruzumna’s Penelope instantly takes to deference when he shows up, it’s pure muscle memory of a survival tactic. And then there’s Penelope and Odysseus’ son, Telemachus (Randall Scott Carpenter). He wasn’t raised by a father he’s never known, but he isn’t so different from dear old dad, just with a brand of rage and entitlement that’s coated with a veneer of fawning sensitivity. Perhaps Phemius is a different type of man, and there are definite signs here that he is, but the character is a little too thinly drawn for us to know for sure. Given that this is a production by a writers’ group, it’s not so surprising that the play itself is more polished than the production, also directed by Tourino Collinsworth. But aside from a tendency to have characters tromp down the creaky movable seating at West of Lenin, the staging has a simplicity that serves the material just fine. Tweaking an established work offers an entry point for the concerns of “Maiden Voyage,” but the play finds its own path, removed from notions of satire or pastiche, and it’s a much stronger work because of it.